Sea-run browns are beloved by intrepid fly anglers everywhere. 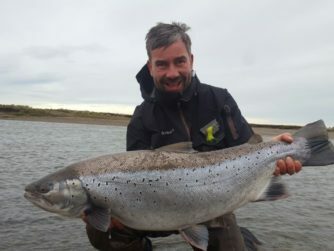 And of all the places we travel to target these formidable fish, Tierra del Fuego stands out as remarkable due to the size and power of its record-breaking fish. 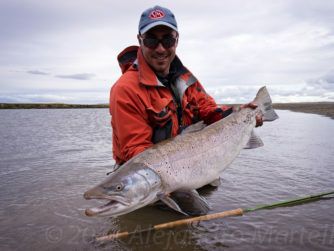 Sea-run brown trout (salmo trutta) were introduced to the rivers of Tierra del Fuego by British expat John Goodall in the 1930s. Long story distilled, those industrious imports eventually discovered the Atlantic, attracted by its rich food supply. They packed on the pounds during their oceanic sabbaticals and upon re-entering freshwater to propagate the next generation, they had reached otherworldly proportions. Fly fishers have rejoiced ever since. Tierra del Fuego has been described as the end of the earth. Which is an apt characterization. The island archipelago marks the southernmost extreme of the Americas; where human development has come at a glacial pace, mostly thanks to its utter remoteness. Area rivers are formed in the Andes, where they are propelled by mountain gradient toward the flat rolling steppes, finally fanning out into the brackish estuaries of the South Atlantic. 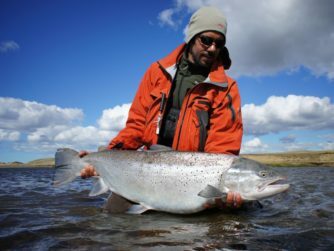 And in the Río Grande, the largest watershed on Tierra del Fuego’s Isla Grande, you’ll today find the greatest population of sea-run browns anywhere—an annual return of tens of thousands of wild trout. 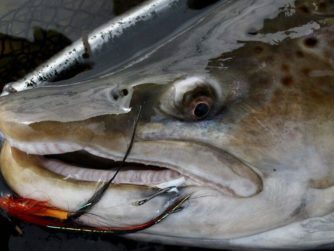 Kau Tapen is a sea-run brown trout institution that’s steeped in regional history. 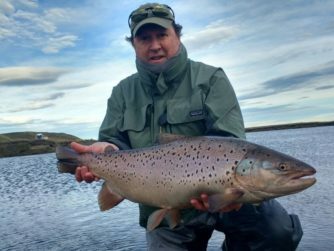 Located on the middle section of the Río Grande, and adjacent to the river’s best tributary, the Río Menendez, the lodge has been serving spectacular sea-run brown trout fishing since the early 1980s. In addition to exclusive access to unpressured beats, the atmosphere inside the lodge is unmatched. The great hall features a grand fireplace where anglers can kick back, sip Malbec, and add their stories to the aura. Fine dining is a breakfast, lunch, and dinner standard. And immaculately appointed rooms provide a cozy sanctuary for hardworking anglers at day’s end. 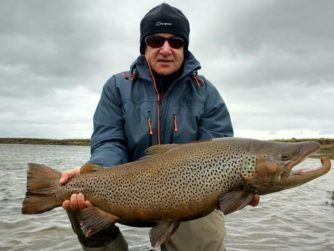 Anglers at Villa Maria, on the other hand, have the benefit of fishing the lower portions of the Río Grande, where its braided waters are home to some of the freshest, fiercest sea-run brown trout in the system. This section is ideal for spey casters due to its longer and wider pools that cater beautifully to the swing. Like Kau Tapen, the quality of the service—from the seasoned guides to the veteran wait staff—makes for a memorable experience both on and off the water.